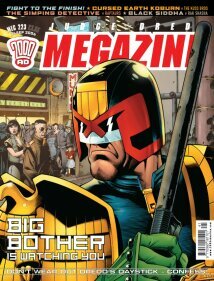 A great Dredd cover from Dylan Teague. The classic 'grumpy' pose, looking mean and threatening. So why not start this review with the future Lawman himself in a 12 page episode called How To Succeed In Bizness. It starts in one of the rich and elite sectors of Mega City One with a three-quarter page splash of the city skyline. Dave Taylor's art is quite cartoony and very different from the recent Chris Weston episode. It isn't my favourite style of art, but there is a lot to like in Taylor's art. That opening panel, for example, is genuinely lovely. It's a good Alan Grant tale that has Dredd running all over the city looking for a murderer. I liked the narration provided by the business school's instructive literature - a neat idea that worked well. And Black Siddha also ended in this issue as well. Rohan and Rak face off once more and there is a strange episode of a scorned woman extracting her revenge. It ends on a cliff hanger so there are clearly intentions to bring this back, and I shall be glad to read it again. A good job from Mills and Davis. The reprint section... Well it turns out High Lord Barnes is pulling this from the next issue. Charley's War will still continue, which is good news as I am still enjoying it, but the other reprint will be replaced with a new story and new features designed to make our ".. reading experience broader and deeper..". Our esteemed editor suggests TPBs or 2000 AD Extreme as alternatives. The latter was a monthly mag reprinting stories in their entirety. For example, I picked up issue 8 off eBay because it was Firekind. Now this seems to me to be a ploy to push the Extreme Edition. Of course, it could be they simply think more new stories and features should be in the Meg. Some feedback in Dreddlines has suggested this. I shall reserve judgement, but I'm unhappy... Finding the Extreme Editions second-hand is much tougher than the Megs. Still, Hell Trekkers concluded. Shall I say if they make it or not? Nah - I will leave that as a tease! Lets just say I thought the end worked well and I have enjoyed this story. I still admire the way Grant and Wagner kept track of 111 Trekkers through the whole 21 parts. Meg 228 - Hit The Deck!